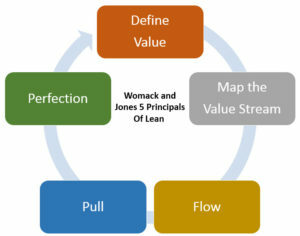 Lean Six Sigma has many tools but the best tool to address Operational Excellence is called a Value Stream. A Value Stream captures the performance of every process that is used from customer request to solution delivery. The overall performance through a value Stream is referred to as Rolled Throughput Yield (RTY). This is the percentage of a product or service delivered through a system from start to finish without error or defect. The time it takes to get through a Value Stream is referred to as Lead Time. Whereas, both of these metrics focus on Value Stream performance, analogous metrics work for each process. Once you have the knowledge of the overall Value Stream performance and you want to improve that, then you look at the performance of each process within the value Stream. As you obtain this Profound Knowledge of your Value Stream, you have all the information needed to direct you where to focus your improvement efforts. If possible, the next step is to create “pull” where ever you can. This may be explained a little better with an example. Ford Wayne, Indiana put up a website for individuals and businesses to request building permits. By collecting routing information through the website the permit request can be automatically routed to the right individual. Rather than fill up this individuals email with requests, a pull system is set up. Each of the building permit analysts then goes to a cue to wait. When the analyst is ready they go to the system and ask for the next building permit. This may seem nonsensical however, pull systems outperform push systems. The last step, which goes on forever, is to continually improve the process.